SAXX underwear has been around since 2006 and continues to grow and may change the way men wear underwear. SAXX’s focus is “to equip you with game-changing, next-level apparel that allows you to move freely, without restriction — apparel that feels like it’s barely there, that elevates your everyday experiences, that just works.” You can read more about SAXX in our Quest 2.0, Kinetic and 2n1 Kinetic Running Shorts reviews. The SAXX BlackSheep line is their iconic Boxer brief made with 95% merino wool and 5% spandex. The boxers have the features that set SAXX apart from other brands – Ballpark Pouch, Three D fit construction, and Flat Out Seams. The boxers also feature the wide anti-roll moisture wicking waistband and the wool is naturally anti-microbial. The SAXX website does a nice job describing their products and is worth a look. The Blacksheep boxer briefs retail for $44.95. SAXX also offers a Blacksheep long sleeve top made of the same merino wool. I am 5’6” and weigh around 180 pounds. I received a size large from SAXX and the initial fit seems to be good. The fabric is soft and feels comfortable against my skin. I like the wide waistband and there seems to be just enough stretch to keep the boxers in place. 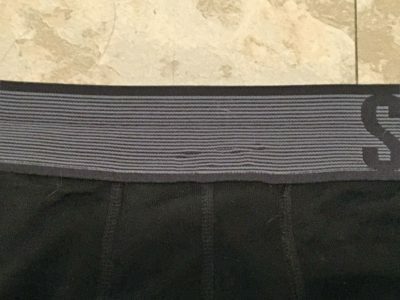 The waistband on these boxers seems to be about twice as wide as the waistband on the other styles of boxer briefs that I have used from SAXX. I evaluate underwear on several characteristics. Number one is comfort – are they comfortable to wear? Do I want to wear them or do I have to wear them? Does the BallPark Pouch really make a difference? Do I chafe? The second characteristic is durability. How well do they last? Can I wear them several days without seeing any undue wear? Do they lose any elasticity over time? Third is smell. Wool is known for its anti-stink properties. Can I wear them for multiple days without chasing off my hiking partners? I have 66 miles of hiking on the SAXX Blacksheep boxers in addition to everyday usage. 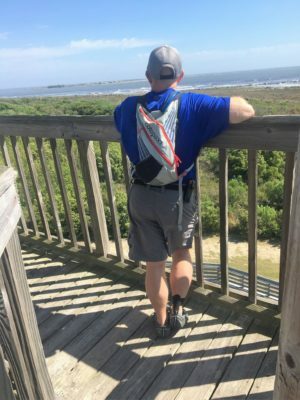 I wore the boxers while hiking at the Woodlands Conservancy in Belle Chasse Louisiana, hiking and camping at Grand Isle State Park in Grand Isle Louisiana, and while hiking and camping at Buccaneer State Park in Waveland Mississippi. Temperatures ranged from cool 60s to overwhelmingly hot 90 plus in Waveland. I experienced heavy thunderstorms during one of my Buccaneer State Park trips, but mostly just hot and humid summer days. I generally review underwear on comfort, durability and smell. The Blacksheep boxers are amazingly comfortable. The fabric is soft and feels good against my skin. I like the wide waist band. It is wider than the other SAXX I have worn and it doesn’t roll as easily from my belly. I do have one challenge, the size – SAXX lists the large size as 36-38 on their website and I would say it is definitely on the larger size of the range. I vary between a 36 and 35 on a good day so I am at the bottom end of the range. The elastic holding the waist in place is great but there is no hugging in the legs of the boxers which allows them to ride up while wearing them. I have not had any chaffing but I look silly trying to reach up my shorts to pull the legs of the boxers back down once they go up. I would probably size down to a medium for a better fit. Durability is my second criteria. The boxers have displayed excellent durability. There is a little bit of a pull in the waist band, but other than that they look brand new. I have not done anything special to launder the boxers. I toss them in with my other clothes and they go through the wash and the dryer with no ill effects. My final criteria is smell. Wool is known for its anti-smell properties, and these are no exception. I have worn them for my lunchtime walks and workouts for a week straight in hot and humid south Louisiana conditions with no ill effects. They certainly are not fresh at the end of the week, but the smell is rather mild considering the conditions that they were exposed to. Overall, I am pleased with the Blacksheep boxers. They are comfortable but they are pretty big on my which leads to the legs riding up. I think that sizing down would solve this problem. Other than this one issue they are bomber. 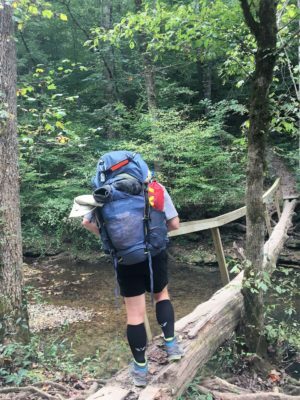 I have used the SAXX Blacksheep boxers while hiking and running on the Mississippi River Levee near my house and while backpacking at the Walls of Jericho which is in the James D. Martin – Skyline Wildlife Management Area on the Alabama – Tennessee border. 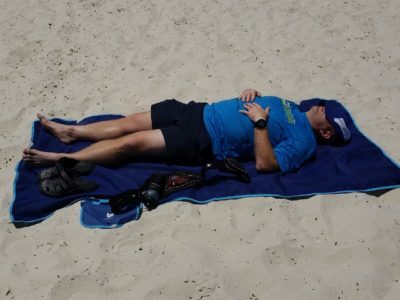 Temperatures have been hot as expected for summer in the south with oppressive humidity. As I have said before – comfort, durability and smell are the main characteristics I evaluate when reviewing boxers. The boxers have continued to perform excellently in all three of these categories. The fabric is very comfortable against my skin and I really like the wide waist band. The wool fabric has proven to be durable as well. They still look good. The pulls that I noted in the last review don’t seem to have grown further. The wool fabric also means that these boxers really combat the funky smell factor. My only negative is the sizing. They are just too big for me to wear during high energy activities. I am comfortable wearing them to work or for everyday wear, but they are too loose and ride up too much when I am running or backpacking. I own four different types of SAXX boxers – Quest, Kinetic, Vibe and the Blacksheep. I have the same size in all four pairs and the sizing is all over the place. The fit is good with the Quest and Kinetic but off on the Blacksheep and the Vibe. The Vibe have the same issue, they are too large and ride up. If I can get the sizing right, I would highly recommend these boxers. They perform well in all of my review categories. This concludes my review on the SAXX Blacksheep Boxers.